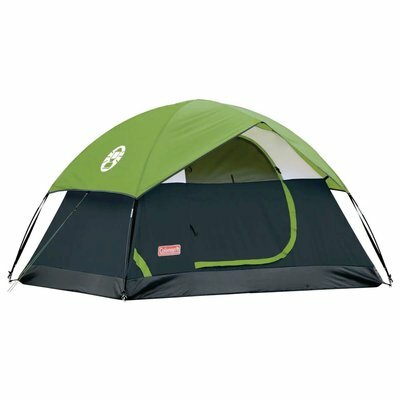 Set up camp in a compact, yet spacious tent with the Coleman® Sundome® 6-Person Dome Tent. If it rains, this tent Keeps You Dry…Guaranteed™, thanks to the WeatherTec™ system, which uses a tub floor with patented corner welds, protected seams, and a covered zipper to help keep water out. Meahwhile, the compact dome shape and a strong frame is tested to withstand 35+ MPH winds. You'll get even more weather protection from a door awning and an included rainfly. A ground vent and two windows increase air circulation to help you stay cool and comfortable. Setup is simple with snag-free, continuous pole sleeves; the patented pin-and-ring system; and snag-free Insta-Clip™ suspension. Inside, there's enough room to stretch out on a queen-sized airbed, and storage pockets help to keep small items organized. When it's time to head home, the tent easily packs up into an expandable carry bag with a rip strip until you're off on your next adventure.